As the Top Gear team once famously demonstrated, the motion of the ocean makes for a bone-jarringly rough ride the faster you move across its surface. However aboard this prototype catamaran from Nauti-Craft, you'll barely feel the rolling of the waves at any knot. 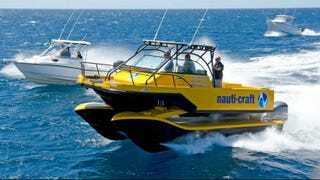 Rather than allow the ship's primary hull to constantly crash against oncoming waves, this prototype from Australian shipbuilders Nauti-Craft instead lifts it out of the water and sets it atop a pair of catamarans. Separating the deck and the catamarans, a series of hydraulic shock absorbers act to minimize the repetitive impacts those onboard must endure. It's similar in concept to the full suspension seen on mountain bikes or the kinetic suspensions found on many modern ATVs and 4x4s.